For the physician, composer and musicologist Peter Lichtenthal of Milan the music of Mozart - whom he considered to be a true genius - was always the measure of all things. In order to also make the larger-scale pieces available to circles of aficionados, Lichtenthal arranged several works by Mozart for smaller chamber music formations. 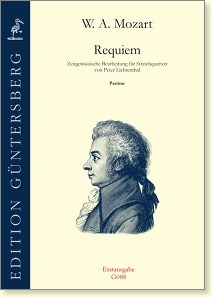 These included also Mozart's Requiem arranged for string quartet, which is presented here in print for the first time. Lichtenthal probably worked from the first edition, which had been completed by Franz Xaver Süssmayr and published in 1800 by Breitkopf & Härtel, Leipzig. Even with a work as widely known today as Mozart’s Requiem, this concentrated view through the prism of the string quartet provides us with a new, or at least a different manner of approaching the piece.